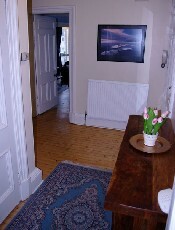 This lovely, bright and spacious two bedroom top floor flat is situated in a traditional Edinburgh tenement building, with large lounge and Georgian style tall bay windows. The flat benefits from detailed cornicing and high ceilings, giving a real feel of space and light. The flat has FREE secure wi-fi access, cable TV and DVD player and FREE UK landline to other UK landline telephone calls included in the price. The windows are fully double glazed and the flat also benefits from central heating. The kitchen is spacious with a fully-fitted kitchen and lovely views across the Forth. 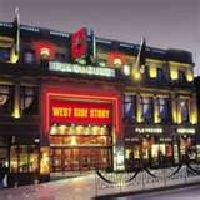 The flat is within easy walking distance of Edinburgh's famous Playhouse Theatre . It is surrounded by the numerous pubs, clubs and restaurants of the fashionable Broughton Village and is close to the major tourist attractions and shopping in Princes Street. There is a co-op convenience shop almost opposite the flat, just across a pedestrian crossing and there is also a mini Tesco a few hundred metres away, so you don't have to go far for any forgotten items! The flat is within walking distance of the main Edinburgh Waverley train station and also very convenient for bus routes and taxi ranks. The flat has two double bedrooms. The very large master bedroom has a dressing table and stool and a kingsize bed. The second bedroom has a comfortable double bed. Both bedrooms have hairdryers. The king size master bed has Sealy Seattle posturepeadic pillowtop mattress, with 2200 pocket springs. 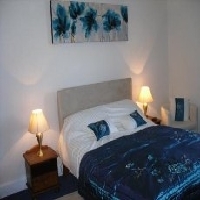 Both bedrooms have recently been appointed to a very high standard. 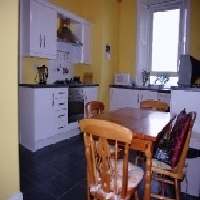 The kitchen is spacious with a fully-fitted kitchen and lovely views across the Forth. It has a beautiful high Georgian style window, which lets in lots of natural light. There is a five ring gas hob, an electric fan oven, fridge, freezer, washing machine, coffee maker, microwave, toaster and kettle. There is also a walk in cupboard with an iron, ironing board and vacuum. There is also a large cupboard in the hall, which is perfect for storing even the largest cases. The bathroom has a full bath and a separate shower and has just been refurbised, with everything being renewed. 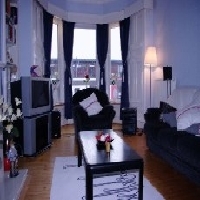 The lounge is large but cosy and has deep cornicing and a generous bay window. There is a marble fireplace with a new gas fire and lots of lighting throughout. The price includes: Free cable TV, Free secure password protected wi-fi access and free calls UK landline to other UK landline telephone no's. It also includes towels, premium bed linen, heating and electricity. 4th January to 31st April: £80 night. 1st May to 31st May: £90 night. 1st June to 31st June: £120 night. 1st July to 31st July: £120 night. 1st August to 31st August: £145 night. 1st September to 30th September: £90 night. 1st October to 30th November: £80 night. Weekly discounts are available for off and mid season, these will be calculated when you book online. For longer term booking discounts, please contact us for a price. To Book or check availability at McDonald Road, please click on the link below. 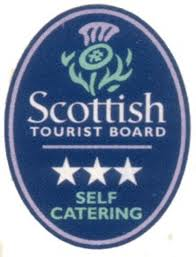 Scottish Tourist Board rated 2012 & 2013 3 stars: A very good standard throughout.